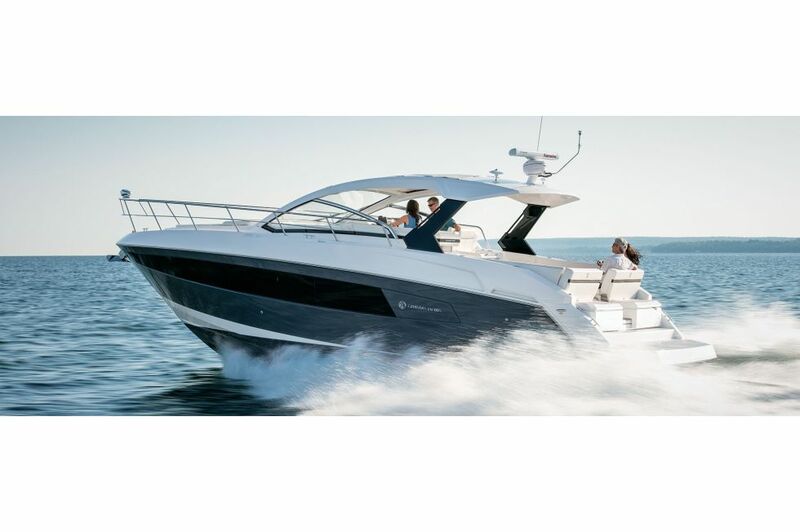 The capable 39 Express Coupe by Cruisers Yachts features the largest cockpit in its class, with more than 150 square feet of integrated cockpit and helm space. 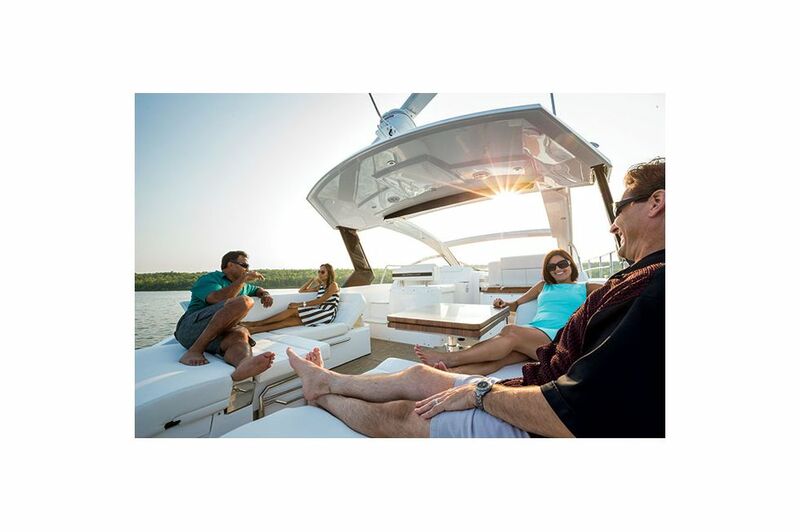 The plush seating is a convertible transom giving you the flexibility to create the space you need for whatever adventure may be on the horizon. 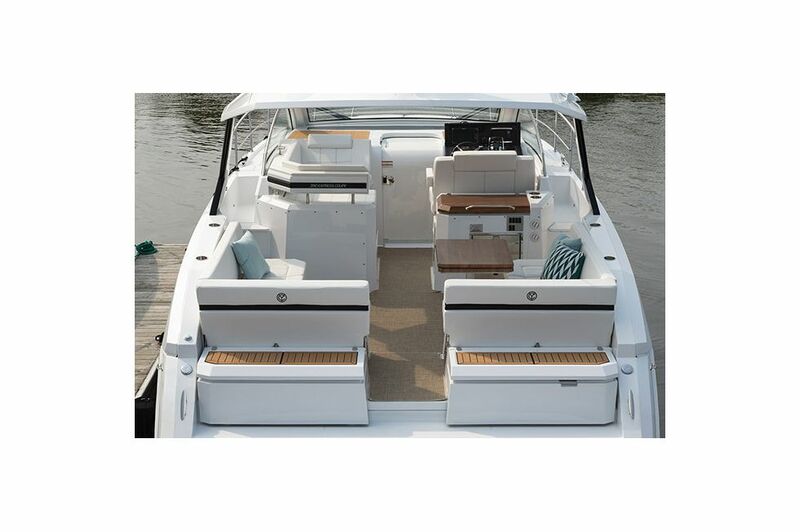 Additional adjustable seating aboard the 39 Express Coupe yacht converts from split L-shaped seats with a central entry gate, to U-shaped booth seating with table, to the ultimate lounger utilizing filler cushions and the reclining transom back rest. 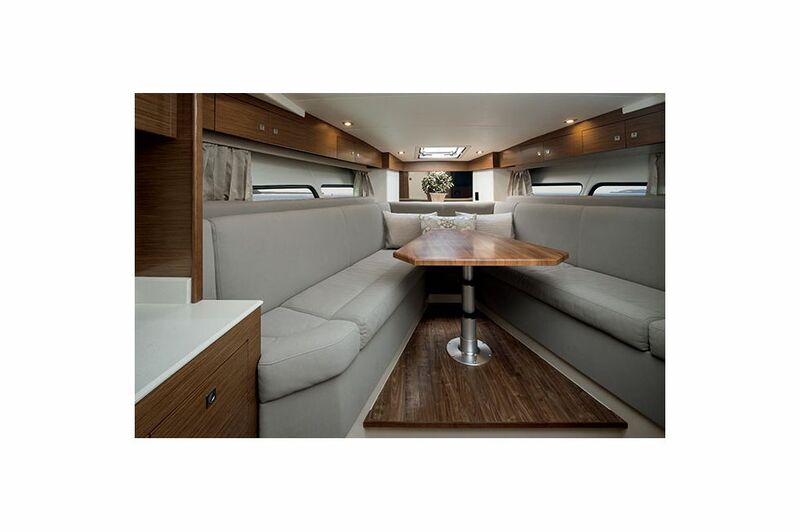 Create the perfect, luxurious space to entertain, play or relax any day of the week aboard your new 39 Express Coupe. 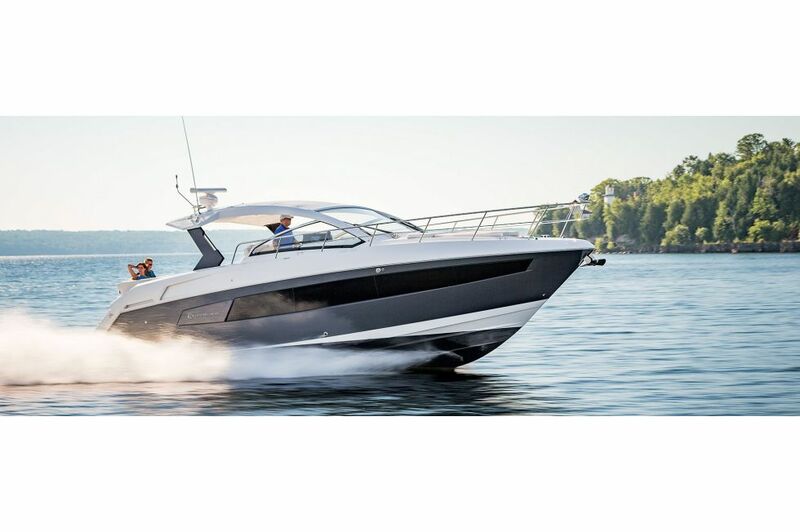 The helm aboard the 39 Express Coupe is impeccably designed to make any captain feel comfortable and perfectly in control of this sporty coupe. With a leather covered stirring wheel and silver polished details the helm of the 39 Express Coupe is designed to feel custom built. Thoughtful details, like a platform for standing at the helm, a well-placed joystick and views from all around make this area of your 39 Express Coupe feel effortless to enjoy. 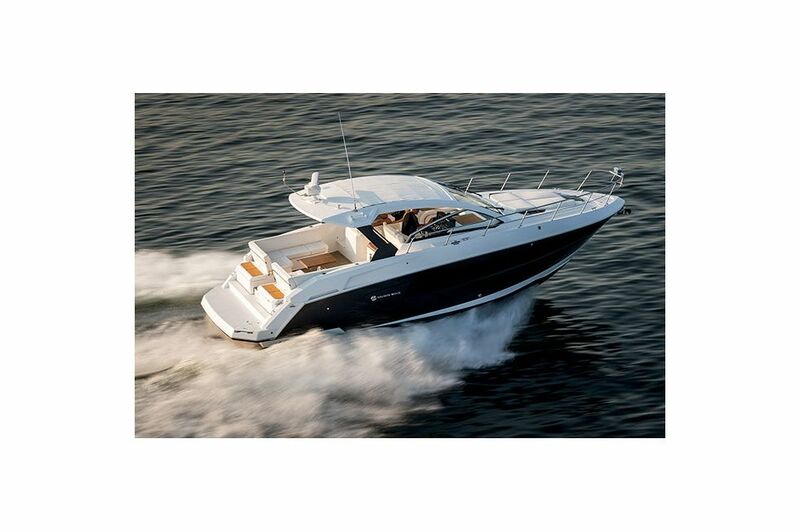 The 39 Express Coupe by Cruisers Yachts has the flexibility and ease you need to make each trip a great one. 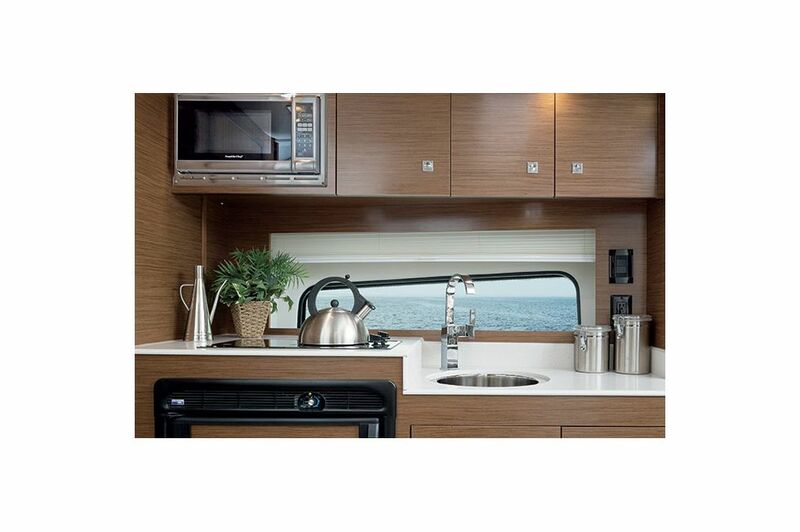 The transom storage available on this express yacht is another addition to that flexibility. 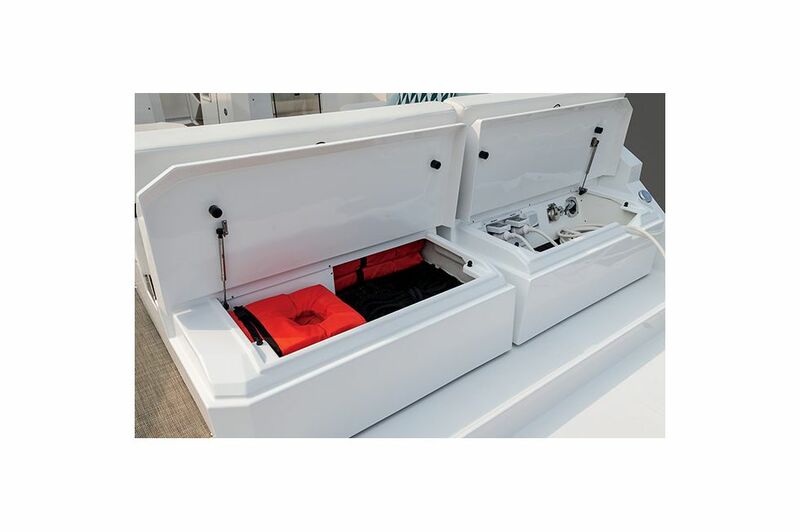 Under two conveniently easy to reach hatches you'll find plenty of space for jackets, fenders, hoses and shore power cords. The warmth and comfortable of the 39 Express Coupe continues into the forward dinette. This space can host up to seven with plush, seating and wrap-around views. 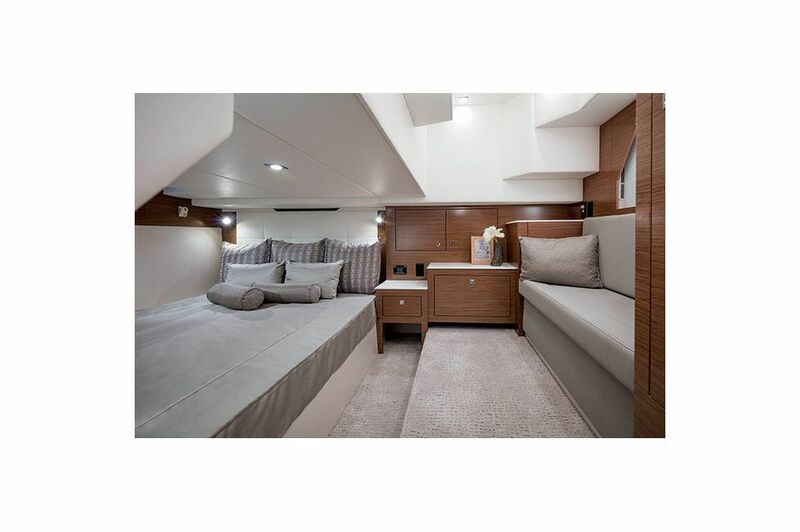 This perfectly laid out space gives immense overhead storage, great standing room and the dinette converts to a full-beam secondary stateroom perfect for overnight guests. When your guests are ready to retire, simply lower the table, add the filler cushion and extend the privacy curtain to deliver a comfortable get-away. We all know the best conversations and memories are created around the kitchen. That's why the 39 Express Coupe's galley is created to feel warm, efficient and perfectly situated. Equipped with a sink, fridge, electric stove top and a microwave/convection oven, you'll have everything needed within a moment's reach. The location of the galley has incredible sea views, stylish details and allows the cook to stay connected with their guests. When you step into the master stateroom of the 39 Express Coupe you'll have find gorgeous features at every turn. This spacious area has excellent headroom, a luxurious double berth, a port-side settee, cedar-lined hanging locker and the latest in entertainment options. Natural light, beautiful built-in lights and fresh neutral colors make this space both bright and comfortable. With plentiful storage options, you'll have no problem making this place your sanctuary and a perfect escape aboard your new 39 Express Coupe. A beautiful escape, the head aboard the 39 Express Coupe is both stylish and well laid out. You'll find everything you need in this easy to access space. Well-appointed lights, designer faucet and storage cabinets are just a few of the great features. The uniquely slanted window and skylight give this an impressive space to enter on an already beautifully crafted express yacht. 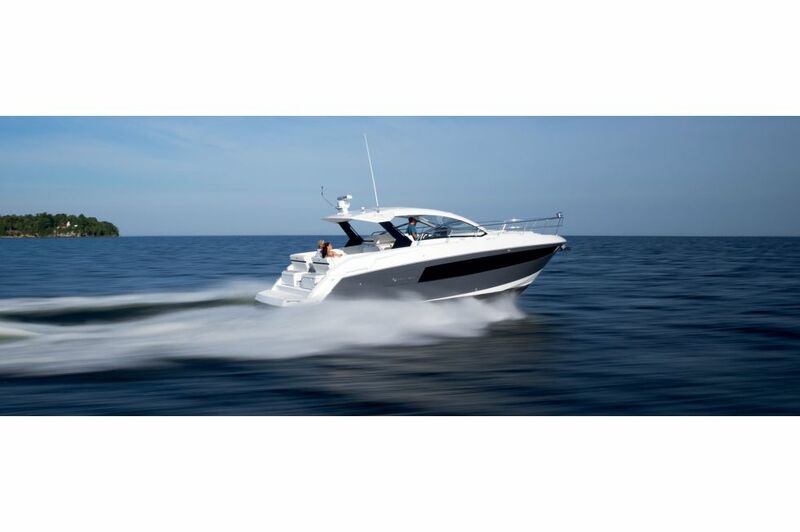 Storage, space and a off the bow ladder make the aft deck of the 39 Express Coupe great for relaxing or a day of watersports. Stretch out in luxury with the bow lounge aboard the 39 Express Coupe. 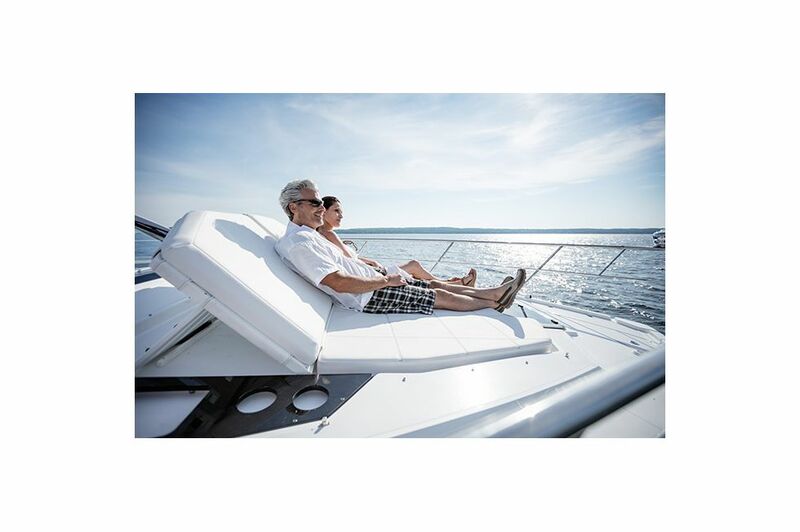 With incredible views and plus, waterproof seating, this space is perfect for soaking in the sun and loving every minute of freedom this beautiful yacht delivers. 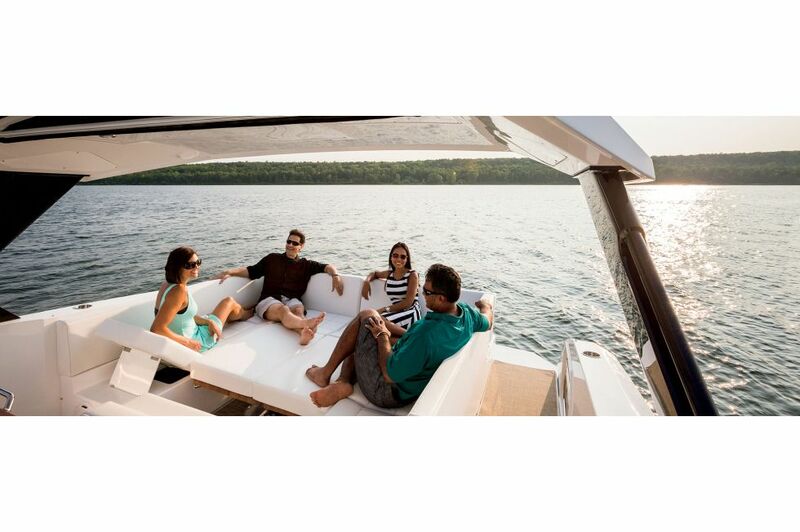 Accessibility is a hallmark of the 39 Express Coupe by Cruisers Yachts and the walk-around is further proof. 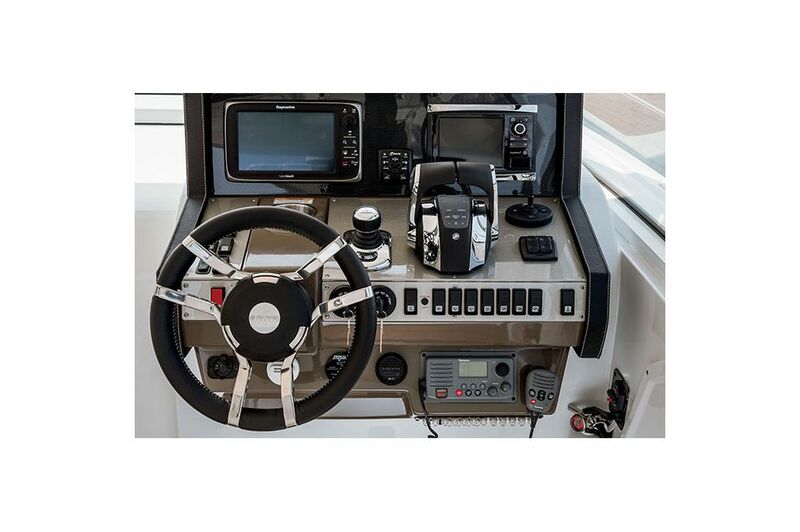 The 10' walk around and self-draining steps offer safe and convenient entry from the cockpit to the bow. 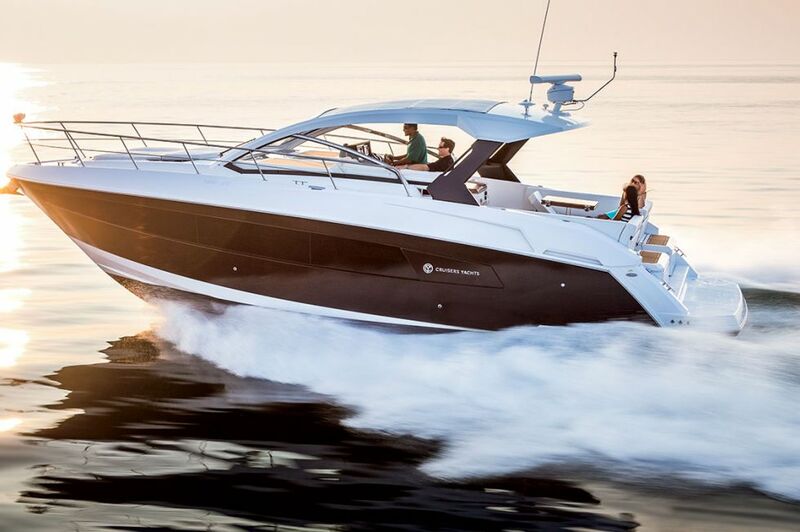 Get where you're going quicker on your new express yacht.